She says nothing of relatives, friends or lovers. She has no plans, no ambitions. Occasionally, she latches on to a man for food, or a warm place to sleep. More often, though, she prefers to stay on her own, sleeping in abandoned buildings, or in a tent she pitches in the damp woodlands. Her aimless wandering evokes diverse responses. A girl vaguely resentful of her mother’s possessiveness speaks with envy of Mona’s “freedom.” An ex-hippie, now gainfully employed as a goatherd, chastises Mona as selfish, lazy and irresponsible. (“You’re not a dropout — you’re just out! You don’t exist!”) A buttoned-down agronomist, patiently awaiting the demise of his wealthy, elderly aunt, is terrified by Mona’s matter-of-fact anarchy. A derelict who camps with her in a deserted mansion is bitter about her sudden disappearance — but grateful that, after all, she didn’t steal his transistor radio. And so it goes, anecdote linking anecdote, as we trace Mona’s path from a dip in the ocean to a stumble into darkness. She travels in silence along wintry landscapes, as solitary as the bare trees clawing at overcast skies. She seeks nothing more than the next ride, the next resting place, or the next place to cadge a meal. She merely shrugs off the trauma of being raped by a passing stranger, or the disappointment of a short-lived relationship with a vineyard worker. For a while, she seems beyond pain, beyond humiliation. But even Mona has her limits. performance as Mona, betraying not a single trace of personal vanity as she slips seamlessly into her role. Every physical detail — everything from the dirty fingernails to the tattered leather jacket — is just right. More important, though, is Bonnaire’s impressive ability to convey Mona’s surliness and cynicism without obscuring the character’s naked vulnerability. Vagabond doesn't try to explain Mona. Indeed, the narrator’s inability to comprehend Mona’s motives, or to discover the wounds that fester in the dark corners of her heart, is the whole point of the film. 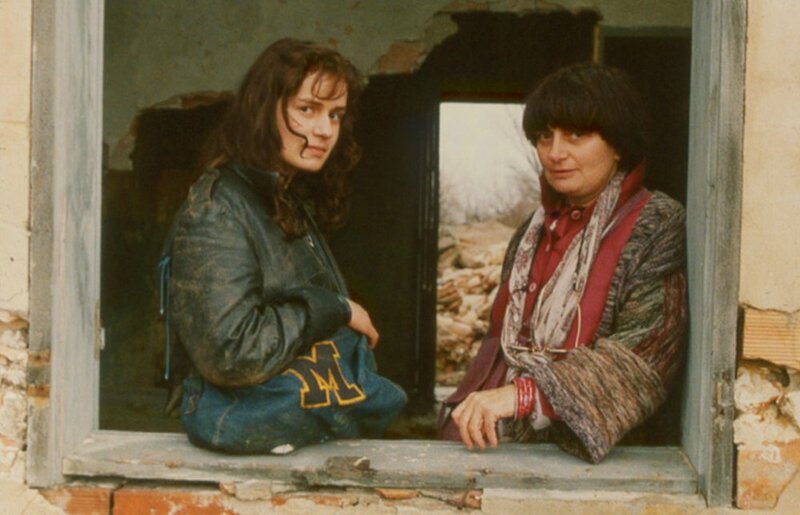 In Varda's view, some people quite simply are unknowable. They plod lemming-like toward self-destruction with the ruthless efficiency of a guided missile. And nothing anyone can do or say can deter them from their course. There are few things in life more disturbing — and, yes, more threatening — than the spectacle of someone who just doesn’t give a damn. But, much like a violent traffic accident or a spectacular natural disaster, the spectacle has a mesmerizing fascination.